From December 7-8, VDMA Germany Plastics and Rubber Machinery Association stated for the first time a technical conference combined with a B2B meeting in Tehran, Iran. Over 500 participants came from the Iran plastics and rubber processing sector, local resin producers as well as branch associations. The event was opened by the association’s chairman, Ulrich Reifenhäuser, and the German ambassador to Iran, Michael von Ungern-Sternberg. Statements on today’s situation in politics, industry as well as the plastics and rubber industries in Iran have been given by representatives from IDRO (Iran Development & Renovation Organisation), the Chamber of Commerce, the Ministry of Industries and Business and the Iran National Plastics & Polymer Association. With an overall number of 37 presentations in five different workshops – automotive, construction, packaging, medical and peripheral, specialized equipment – 21 association members from Germany, Austria and France introduced solutions specifically related to those fields of applications. Speakers mainly represented manufacturers of injection molding, extrusion, blow molding, foaming as well as peripheral machinery and equipment. At the closure of the event all parties involved expressed contentment and confidence resulting from more than 300 B2B meetings. 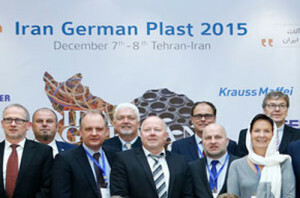 As Reifenhäuser stressed, chances for a political change and economic easing are good and optimism is running high, the time is ripe to re-start German-Iranian relations in the field of plastics and rubber.